June 26, 2016, 8:19 PM · Epcot's International Food & Wine Festival is the park's most popular event for good reason. It features so many great foods and wines that one day at the park is not enough. Running for 21 years, this year's Epcot International Food & Wine Festival will feature 30 deliciously themed food booths running from September 14th to November 14th. That's a whopping 62 days of food and wine indulgence! Today, Themed Park Insider, along with other media and Tables in Wonderland members who purchased a ticket, got to attend a preview event which enabled us to sample some of the food and wine they plan on featuring at the Festival. We plan on telling you about some of the amazing food and wine along with some of the fun culinary events they have planned, including some of the new selections for this year. So get excited! 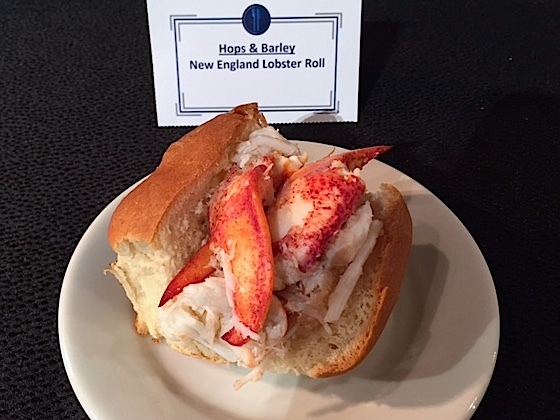 The Hops & Barley booth is bringing back the New England Lobster roll. No more lobster mix, this year they are going back to the basics with pure fresh lobster on a nice soft buttered roll. Last year it was a lobster mix which was good, but not great. Way to bring it back. 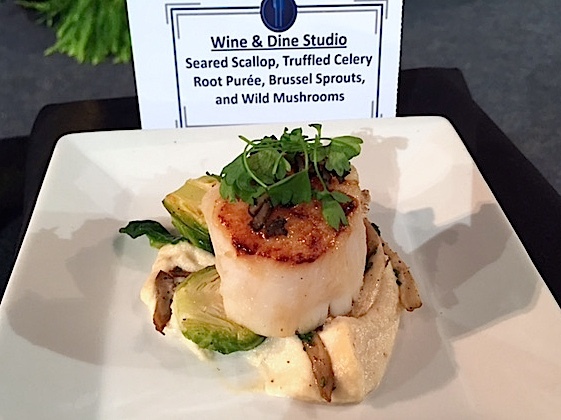 Wine & Dine Studio will have a new dish featuring a seared scallop, truffled celery root puree, Brussels sprouts, and wild mushrooms. The seared scallop is amazing to begin with, but everything goes so well together. The truffled celery root puree does not taste anything like celery and the Brussels sprouts have a nice crisp to the outside as if they were pan roasted. The wild mushrooms make a nice addition as well. Disney hasn't named the booth for this, but be sure when they do, we will find out and circle it on our map. This dish was absolutely delicious. 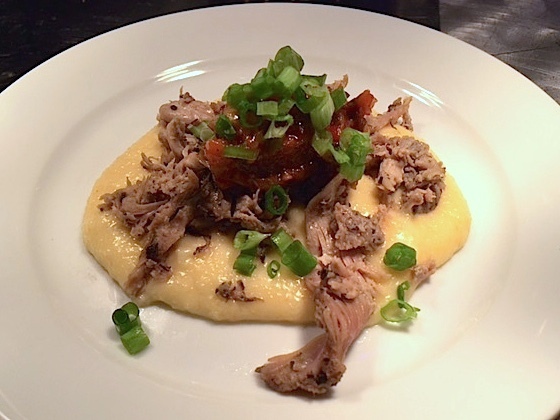 Duck confit is seasoned and slowly roasted in duck fat. It's placed on top creamy and I do mean creamy, polenta. Topped off with fire roasted salsa, it makes one savory dish we kept coming back to. The desserts are plenty at this festival. A lot of people, including us, loved the Chocolate Studio booth's Liquid Nitro Chocolate-Almond Truffle with Warm Whiskey-Caramel sauce. 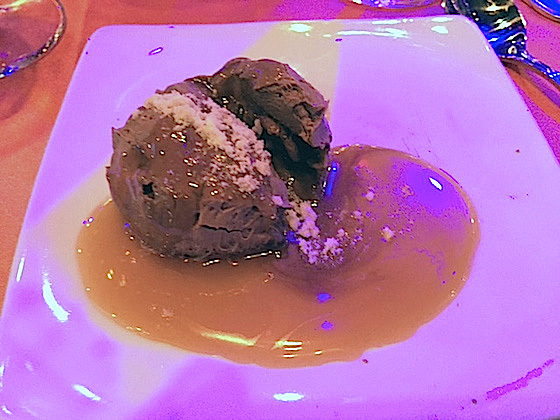 The chocolate-almond truffle had the consistency of mousse and the sauce was to die for. 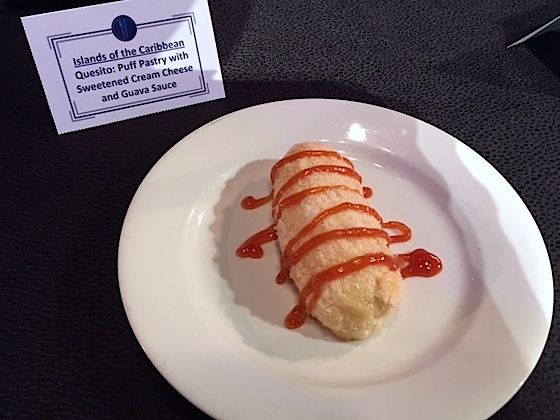 We personally also liked the new-to-the-Festival food booth Islands of the Carribean's “quesito.” The quesito was a puff pastry filled with sweetened cream cheese and topped with guava sauce. Your sweet tooth will be satisfied with these two alone. As for beverage highlights, the Desserts & Champagne booth has Moet & Chandon Ice Champagne that is perfect for a hot summer day. It's light, fruity, and served over ice with a nice mint leaf for added flavor. It can also be served alone, but having it on ice makes it that much more refreshing. In addition to the Chocolate Studio, Wine & Dine Studio and Islands of the Caribbean marketplaces, Epcot will be introducing that marketplace to be named and The Chew Collective to this year's marketplace line-up. 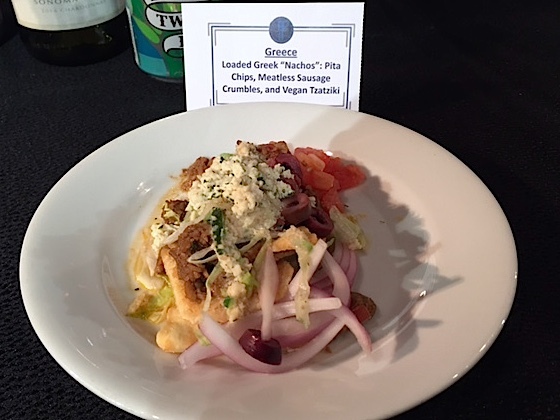 Returning marketplaces will be getting some new dishes, too, including this vegan Loaded Greek "Nachos," made with pita chips, meatless sausage crumbles, and vegan Tzatziki. The Festival will offer more than just food booths, it will feature many culinary events and demonstrations. Everyone can visit the Festival Center for cooking tips, book signings, and more. They are bringing back their 45-minute culinary and beverage seminars, which are reasonably priced at $15 per person. Celebrity chefs such as Cat Cora, Graham Elliot, and Bryan Voltaggio will be on hand to share their favorite dishes at the “What's Cookin' With…” seminar. For $129 + tax will get you and others a chance to see these chefs, partake in a question and answer session, and sip on sparkling wine in these morning only sessions. In addition, there are cheese seminars ($89), Wine and Spirit Boot Camps ($129), country specific dining events ($40-$160), Rockin' Burger Block Party ($99-$199), Party for the Senses ($169-$329), along with many others. An event for every preference. More information about these events and more will be posted on Disney's website July 11th. Then they will announce when you can buy tickets to the events. If you're interested in attending a celebrity event, buy them early as they often sell out fast. Overall, we were impressed. Every year seems to get better and we cannot wait to attend this fall. Make sure to check back here for more updates, event, and concert information, along with our Insider tips on attending the Festival. Let the countdown begin! FYI: Festival access is included with the price of your Epcot admission. Each dish and beverage is separate. Dishes average $5-$9 and come in sample sizes. June 27, 2016 at 1:52 AM · Food & Wine just keeps getting better. It is an absolute MUST for any theme park fan. June 27, 2016 at 5:11 AM · I saw some really good new events as well including the Trader Sam's Mixology Session. Oh boy! June 27, 2016 at 6:51 AM · Wow! Cannot wait for Food&Wine!! June 27, 2016 at 11:09 AM · We have been planning our every 2-3 year trips to Orlando around the EPCOT F&W Festival, and will continue to do so. However, I do feel that the event is almost getting too big for its britches. The special events, seminars, and celebrity meals have gotten so pricey and hard to get that it's almost not even worth trying anymore. What's worse is that some of the separately ticketed events are so overbooked and understaffed now that you feel like you just threw your money away ($65+ for a 3 course sample pairing - 3-4 bites per plate and half serving pours - sitting shoulder to shoulder in a tiny back room with one server handling 4 tables of 10 that were designed to seat 6). I did like the tequila mixology session I did in La Cava a few years ago, but the price on that one continues to go up about 10% every year to a point where you can now buy 2 bottles of tequila at home (or 5 mid-shelf shots in La Cava) for the price of the 3 shots you get in the seminar. The value of this event has declined significantly since the first year we went in 1999. The kiosks still offer decent value (particularly to guests on the DDP who can use snack credits for all food items regardless of price), but you should be careful when booking a pre-reserved event or seminar, which are non-refundable. The Party for the Senses is still a good value as long as you know what you're getting into (read trip reports from those that have attended in the past, particularly in weeks prior, so you can be prepared for the chaos that the event can create). Read the event descriptions very carefully, and don't assume you're going to get anything beyond what is stated in the description. For instance, if you're reading the description for a wine and cheese pairing, don't assume they will serve crackers or anything to eat with the cheese unless it specifically states the type of crackers or bread. For celebrity seminars, don't expect to get anywhere close to the celebrity - the reality is that you'll just inhabit the room with them for 30-60 minutes (unless you're doing a cooking class or exclusive meal - both typically over $150/person). Also, think about your theme park schedule/itinerary when booking any events requiring a paid reservation. If you're planning a day in MK, and reserve an event in the World Showcase that evening, you better have a park hopper. The events also will cut into the time you can enjoy in the parks, especially if you have to travel to a resort, so make sure you have your day planned out correctly. Some events require more upscale dress, so you may need to go back to your hotel to change, which will obviously cut more time out of your theme park day. I don't want to sound like a downer for the EPCOT F&W Festival, because we have been routinely planning our WDW vacations around it for over 10 years. However, having been so many times, we have seen the focus of the event change from a nice add on for guests coming to the parks in a traditionally lower peak season to a typical Disney money-grab. June 27, 2016 at 11:44 AM · Can you talk about how Food and Wine is a big reason that Epcot hasn't bothered to upgrade it's attractions?. It doesn't need to, because people come for the food and wine. Yeah, I know, they added Frozen Ever After and Soarin, but I mean upgrade in any significant way. June 27, 2016 at 2:45 PM · Too big for its britches is how I feel too. Weekend visits are an exercise in patience. Some of this year's new dishes do look great, but I wish the price per sample had been included in this story. Things do get more expensive over time, but I remember when you could go to Epcot with about $45 and eat around the world. Now you can hardly get through three maybe four pavilions before you are looking for an ATM. Never the less, it's a great time with friends as long as everyone is willing to chill out an not worry about completion theory. June 29, 2016 at 1:17 PM · @Brian - that's a good question, it did taste fresh. Could be a farmed lobster though. @ TH Creative - Not a downer, you're still going. Those seminars can be indeed very expensive. @Disfan - Yeah, that could be part of the reason. Disney seems to look at their cost to benefit analysis where it's just easier to upgrade current attractions the way they do now than to build a new one entirely. Probably a lot of their budget is also going to Star Wars in Hollywood Studios too. Although there is space to add a new continent between the current ones they have now, they see no need. @Rob - yeah I think we all kind of feel it's gotten way bigger and way more crowded especially on the weekends. However, I think we can all agree it's one awesome event that one should try to attend.